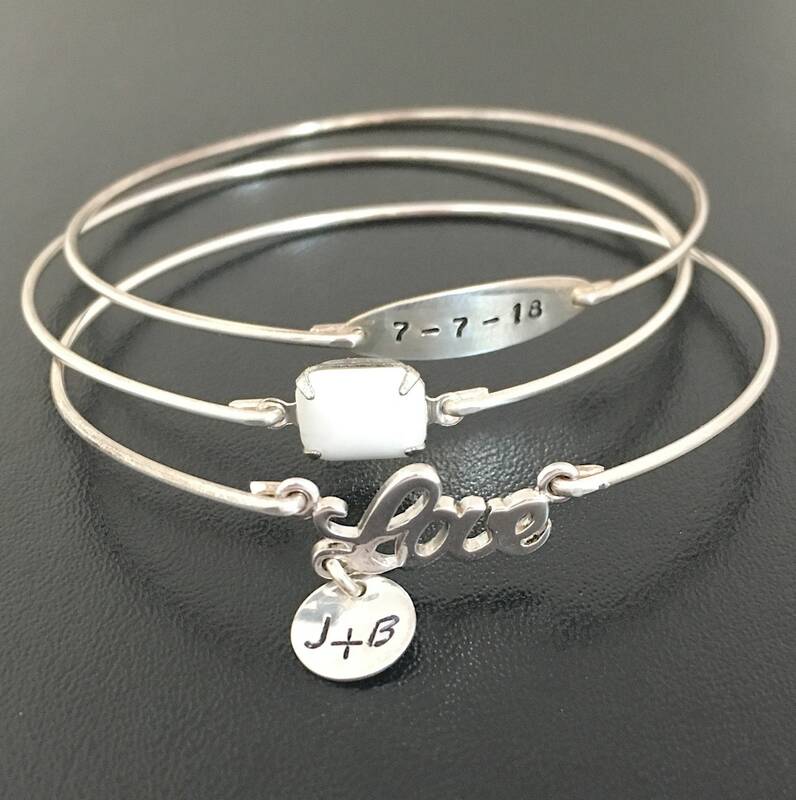 This set of three bangle bracelets makes that perfect gift for bride from mom, dad, sister, best friend, sister in law, mother of the bride, or mother of the bride. It consists of a silver-plated love charm with couple's initials stamped on a sterling silver disc charm dangling from the Love charm. Next comes the special date to remember stamped on a sterling silver oval to keepsake the couple's wedding date or special anniversary date. The 3rd element is a white glass stone to mark the white wedding ceremony of the couple. All pieces are paired with sterling silver bangle bands. 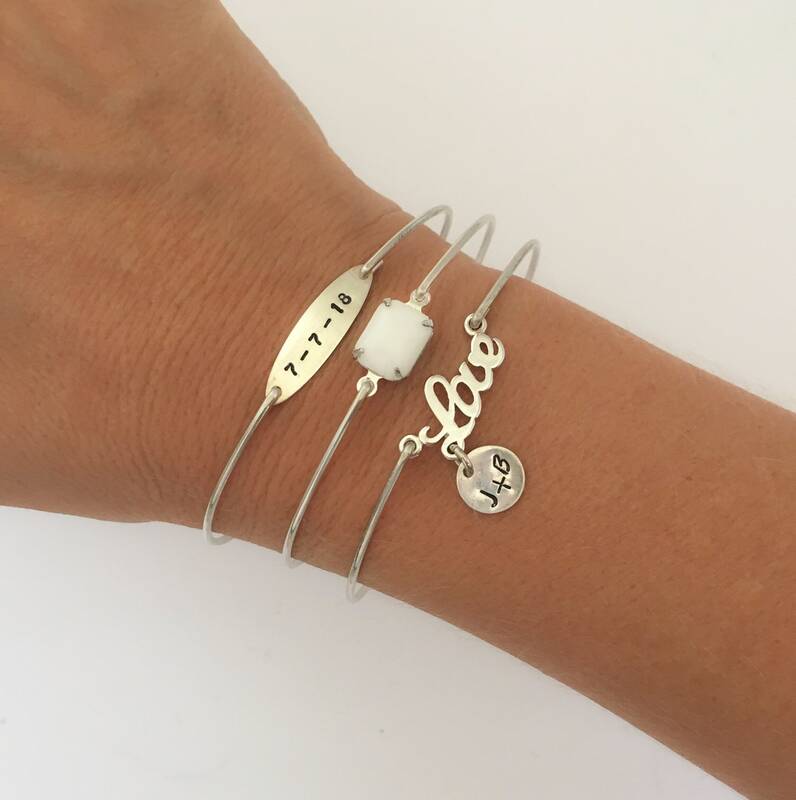 You can also select to have this set with a gold plated love charm, 14k gold filled disc with initials, 14k gold filled oval with date, and 14k gold filled bangle bands. ♦ If you would like a different stone, shape or color, or a pearl, just let me know in the "notes to seller" section during checkout. I have many different stones available in my shop for your personalized bridal jewelry. Some might be an extra charge, some might be an even swap. This bracelet set makes a great wedding day gift for the bride. It also makes for wonderful anniversary bracelet for wife. 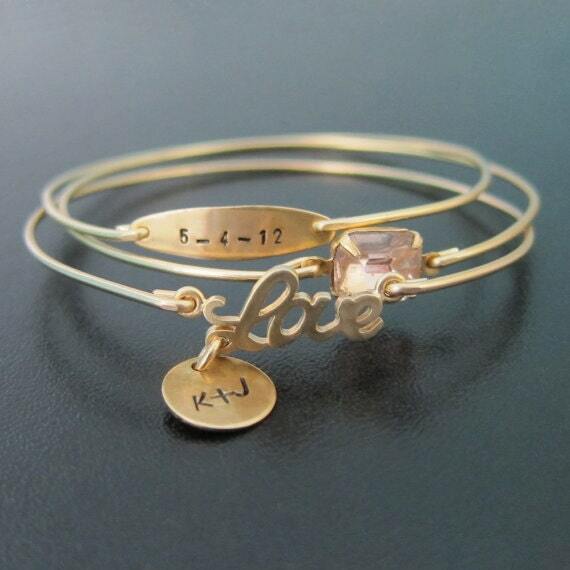 Please specify size in notes to seller during checkout for your personalized wedding bangle bracelet set. Choose from one of my regular sizes below by measuring one of your favorite bangles. Or give me the circumference of the widest part of your hand where the bangle has to be pulled over; than I can size your wedding bracelet bangle set for you. All of my bangles are closed and can’t be opened. Therefore, they have to fit over the hand. 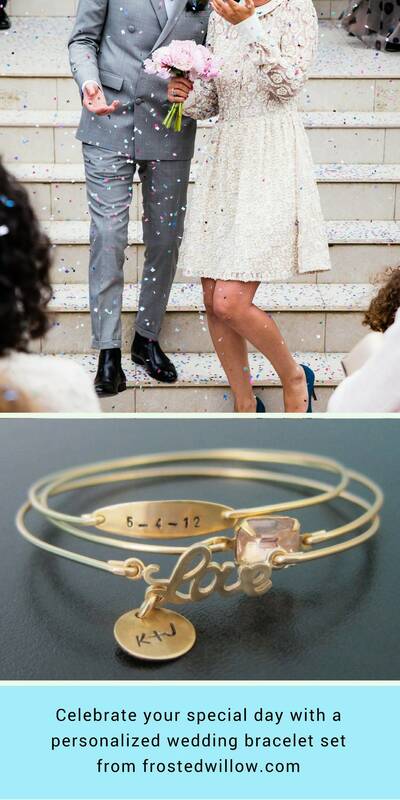 Custom: specify a custom size for your wedding date bracelet set. This personalized bracelet for bride created and hand crafted with great care and love for you and yours. All of my items including this gift for wife are special handmade creations that are original Frosted Willow designs. 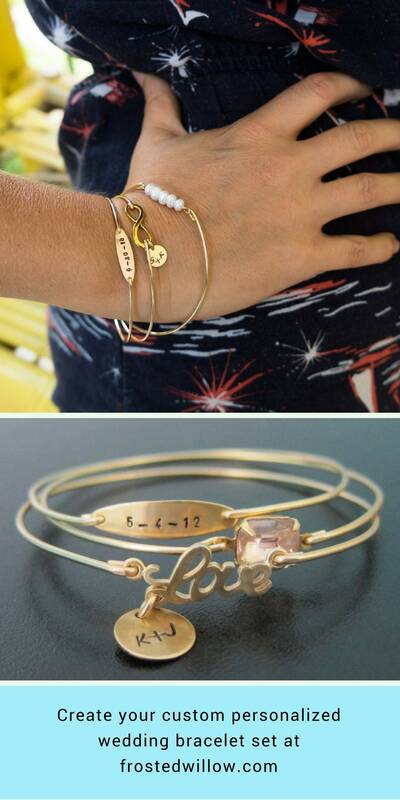 I hope you love this personalized wedding bracelet.